Jaguars QB Blaine Gabbert looks little like the prospect I watched at Missouri. Find out why, below. Photo by PDA.Photo. Ranking players is perhaps the least important part of the analysis I do when I create the Rookie Scouting Portfolio. It’s the conversation starter. The attention-getter. The marketing schtick. It’s the three-sentence summation of a complex subject that you need to learn to give at a cocktail party or you come across as David Fincher’s depiction of Mark Zuckerberg in the Social Network. As much as I value Twitter for attracting readers like you to the work I do, I’m not much on cocktail party chatter. My primary goal with the RSP is to profile skill position players and analyze their games to evaluate their current skills and potential. I missed the boat on Andy Dalton. He's turning into what I thought Bruce Gradkoswki had potential to become. Photo by SD Dirk. Joe Flacco, Delaware: I was impressed with Flacco’s arm and mobility, but I thought his decisions as a passer were too reckless – especially from the pocket – to rank him above the other players I’ve seen here. Omar Jacobs, Bowling Green: I really liked Jacobs, but I thought he needed another year in school and he wasn’t adept under center because he came from Urban Meyer’s spread system. His fundamentals such as footwork, play fakes, and timing from drops needed work. Matt Flynn, LSU: I thought Flynn looked much better as a sophomore than he did as a senior. In fact, I thought he was better than Jamarcus Russell when they were splitting time. To be fair, Flynn played much of his senior year with a high ankle sprain and his receivers frequently let him down. In hindsight his pocket presence probably regressed only in terms of the situation he faced as a senior, but I didn’t make that assessment at the time so it’s not fair of me to rank him higher. Brady Quinn, Notre Dame: I thought Quinn’s accuracy and his decisions under pressure was erratic. I worried he’d have a significant learning curve in the NFL despite some nice physical tools and flashes of good play in South Bend. Brian Hoyer, Michigan State: He just missed the cut. His college offense was conservative and he had consistent issues throwing the ball high, overthrowing receivers, and staring down receivers. However, I thought he was poised and capable of making smart plays under pressure when pushed into situations where had had to bail out his team. Most of his issues seemed fixable, he just had a little too many to place him on my final list. Ryan Mallett, Arkansas: If I were to create a list of top natural throwers of the football Mallett might be in the top half of quarterbacks I’ve studied. But his poise, footwork, and recklessness were issues too significant to place him on this list. Andy Dalton, TCU: I liked Dalton’s accuracy, his potential as a deep ball thrower, and his mobility. I thought he sometimes crossed over the line of aggressiveness into recklessness and work in the spread offense left me with enough doubts that he didn’t make this list. I think I was wrong about him. In hindsight I would have ranked him in the top 15-20 players. He’s more along the lines of the player I thought Bruce Gradkowski could have been. 20. Greg McElroy, Alabama: McElroy lacks the arm power to “crease” the ball in tight spaces between defenders and he’s not the top-shelf physical specimen at the position who can change the games with his legs or take a ton of punishment in the pocket. What McElroy does well is read the field, manipulate the defense, and throw the ball effectively from the pocket with enough anticipation to complete the ball in tight coverage. 2011 RSP Quote: McElroy’s greatest strength is his poise and patience in the pocket. He will stand tall under pressure, slide to an open area in the pocket, and find an open receiver. He’s patient with routes to make sure he’s allowing the play to develop as designed. He also throws reasonably well on the run in the short area of the field. He can make throws on the run in this range moving to his left or his right. He makes basic pre snap reads with accuracy, getting his team into appropriate pass or run plays depending on the defensive alignment. He also shows toughness to take hits and continue stepping into his throws. If McElroy can show some velocity and arm strength to consistently make accurate throws from the opposite hash or in the vertical passing game, he has the smarts and toughness to become a very good pro quarterback. If McElroy improves his arm strength he is a player to watch. I was especially impressed with his skill at feeling pressure and finding passing lanes. What you’re going to see from this list is when I err on a player, I will likely err in the direction of a player who throws with strong anticipation and demonstrates pocket presence over sheer height, weight, and arm strength. 19. Matt Leinart, USC: I labeled the Heisman winner an overrated prospect in the 2006 Rookie Scouting Portfolio because I thought his arm strength was a serious issue in the intermediate and deep passing game. I realized that Leinart was coming off elbow surgery at the end of his junior year, but I also didn’t see a great deal of pinpoint accuracy in the red zone or in tight coverage. His physical skills were also slightly below average and he had a glaring problem protecting the football while in the pocket. Still, there were some things to really like about his game. 2006 RSP Quote: Leinart has very good accuracy on the move to the left. He makes good adjustments at the line and steps up or slides in the pocket effectively. His mobility is underrated. He shows polish as a ball handler in the play action game and demonstrates good use of pump fakes. He frequently gets through multiple reads in his progressions. He sometimes is able to look off the safety before making a throw. Leinart can throw the deep ball accurately when he has time. He is known as a tough football player that performs well under pressure and can take a hit. Leinart makes good decisions: he knows when to throw the ball away and tries to avoid double coverage. I definitely saw a quarterback capable of executing when the stakes got high in a game. However, USC had enough weapons to keep him making plays where the defense forced him to physically improvise and beat them from the corner they painted him into. Leinart either needed more mobility or better arm strength for me to regard him as a better prospect. The only reason I rank Leinart above McElroy is that I thought Leinart’s arm would strength would get significantly better a couple of years after the surgery. Bruce Gradkowski could still have a Rich Gannon-like ending to his career. I'm not counting on it, but the savvy and athleticism are there. Photo by Jeffrey Beall. 18. Bruce Gradowski, Toledo: Here’s another weaker-armed quarterback, but unlike McElroy and Leinart, Gradkowski was extremely mobile. His Combine performance as an overall athlete at the position was as good or better than any quarterback in his class. What I loved about Gradowski’s game was his ability to execute plays by manipulating defenses with his feet, hands, and eyes. 2006 RSP Quote: Gradkowski is very accurate. He is the first QB in Division I-A history to have consecutive seasons with a 70% accuracy on completions (sophomore and junior seasons). I think this guy would make an excellent west coast quarterback. He plays the QB position much like a point guard (which he was a good one) in basketball: distributing the ball and running plays in a way that helps deceive the defense to create openings. This is a heady football player that understands the game and how to execute plays to the benefit of his offense. He throws a very catchable ball. One of his best traits is his poise under pressure. His team really looks to him for leadership. He continued to bring his team back in this game. If he can stay healthy, Gradkowski has the skills to start in the NFL and be a very good player. He should be able to fit into any offense due to his ball handling, arm, and decision making in the pocket. He is one of my favorite QBs in this draft class. That poise was evident last year when he brought Oakland back against the Pittsburgh Steelers in Heinz Field for the victory and this year when he came off the bench against the Browns to catch the defense napping for a game-winning touchdown pass. The problem has been arm strength and getting thrown into the fire too early in Tampa Bay. If I were Jon Gruden and I came back to the NFL with the Miami Dolphins and somehow missed on one of these big-time QB prospects in 2012, I’d steal Gradkowski back from my brother. He has some Rich Gannon-like upside. 17. Adam Froman, Louisville: Froman in many respects reminded me of Gradkowski with a better arm and more physical potential. The free agent rookie signed with the Atlanta Falcons this summer, but he didn’t make the team. I have written a lot about Froman this spring and I’m confident that if he can maintain his enthusiasm and work ethic for the game he’ll earn another chance in 2012. 16. Kevin Kolb, Houston: What impressed me about Kolb immediately was that he demonstrated mobility and pretty good improvisational skills as a senior against some quality defenses. He also worked to lose weight and get into the type of shape necessary to improve his production. The arm strength, accuracy on the move, and quick decisions were impressive. However, I thought he tried too hard to make questionable throws, his footwork needed a lot of work, and he still had a more to learn about manipulating defenses with his eyes while developing more timing with receivers on 3- and 5-step drops. My thinking on Kolb was “eventual starter,” but he’ll be challenged when defenses force him to throw with pinpoint accuracy and throw more complex schemes his way. 15. John Beck, BYU: Another player I’ve written about extensively this offseason, Beck’s mobility, accuracy, and poise were all impressive components of his game. Although he’s bounced around during his NFL career, so did his childhood rival Ryan Fitzpatrick, who had stints in St. Louis and Cincinnati before earning his keep in Buffalo. Washington’s offense is a shambles this season due to injuries along the offensive line, receiver, tight end, and running back, so the situation for Beck to earn the starting job long-term is far less promising than it appeared to begin the year. 14. Vince Young, Texas: The spread offense and raw passing mechanics were obvious concerns for Young, but the big-game poise, big arm, and game-changing ability to scramble were too good to ignore. Although many people now think of Young as a player that couldn’t handle the rigors of the NFL, let’s not forget the comebacks and clutch plays he generated as a rookie. I think Vince Young epitomizes why fans, analysts, and media need to remember that professional football can change a player’s mentality. Some players react to the crucible with greater focus and elevate their game. Others get lazy and fall apart. Young, got lazy and fell apart. This was not what most would have expected from him based on his championship season at Texas. 13. Jake Locker, Washington: I think Jake Locker has the athleticism, toughness, and individual components to his game to develop into a Pro Bowl quarterback in the NFL. I also think Locker has shown enough inconsistency putting all of those skills together that I don’t really know where to rank him and still feel completely comfortable with the decision. If he puts it all together I think he could be the best quarterback in the 2011 Draft Class when it’s all said and done. That includes a spectacular Cam Newton and nearly as impressive Andy Dalton. I think that’s why I have him over Vince Young on this list. He has a better conceptual and mechanical starting point to the craft than Young and more athleticism than all of the quarterbacks on the list before him (Young as the lone exception). As we saw with Young, great football instincts and athleticism can only get you so far in the NFL. Locker has the work ethic that Young lacked. This was a big reason the Titans wanted him and quarterback coach Chris Palmer has told the media about giving Locker an assignment with a jump rope during Locker’s pre-draft team visit and Locker working at the assignment diligently when he went home, and demonstrated significant improvement in the next meeting. There is still a chance that Young could still develop, but he has at least one strike against him. Locker just might be a quieter, less-assuming Tim Tebow in terms of “It factor,” but with actual pro-caliber throwing mechanics and arm strength. He could also turn out to be a complete dud despite all the tools. That’s the nature of quarterbacks transitioning to the NFL. 2011 RSP Quote: Ponder makes strong decisions in this offense. I saw him consistently make correct pre snap reads for quick throws to the correct receiver as dictated by the UNC coverage. 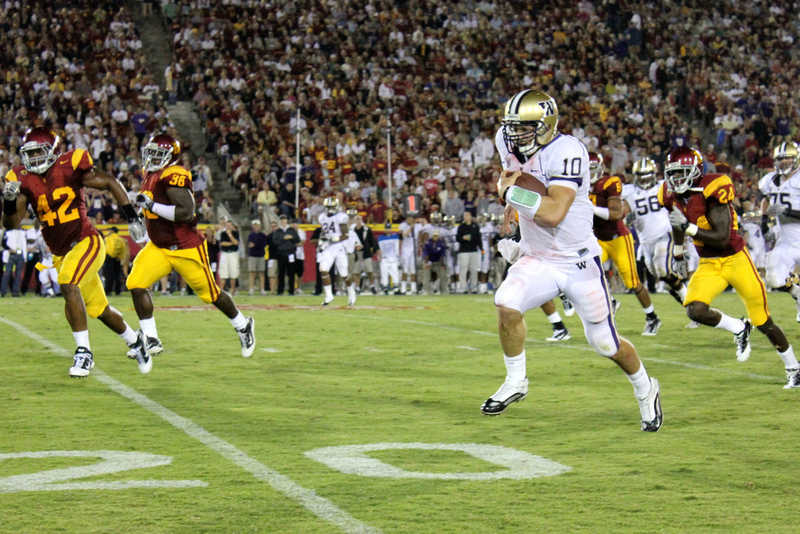 Ponder also used his eyes as an effective tool to draw defenders away from an area he intended to throw the football. He has a smooth, compact release and his drops are precise from center. He operates from a pro style offense and has a good understanding of the mechanics and reads involved with it. His transition to the NFL should be smoother in this respect than some of the more athletically-heralded prospects in this draft class. He has big enough hands to execute very convincing pump fakes and play fakes. I also like that against blitzes or tight zones, Ponder was willing to fire the ball into a tight window when he believed his read of the defense was the best opportunity for his offense to execute a productive play. He repeatedly demonstrated a quick drop, a fast release, and good velocity on these short to intermediate throws. He does a good job of climbing the pocket, but he also has a solid internal clock to know when he has to release the ball before pressure begins to break down. He can throw the ball on the move with accuracy and velocity to his left or right to the intermediate range of the field. He demonstrated this impressive touch and accuracy to his left on throws over 20 yards downfield a couple of times in this game. Ponder might not be the flashiest of the QBs in this class, but he could turn out to be one of the best because of his smarts, underrated athleticism, and excellent accuracy and mechanics in a pro style offense. He flashes the ability to put a lot of skills/techniques together to beat a defense that will have a lot of strong NFL defenders in the future. He might be the most prepared QB for the NFL in terms of his combo of athleticism, passing skills, and understanding of the position. I think thus far, Ponder embodies almost all of the positive qualities of the quarterbacks behind him on this list with the exception of Vince Young’s dynamic running skills that can turn a missed sack into a long touchdown. I think he’s a 10- to 12-year starter. 11. Blaine Gabbert, Missouri: Right now Gabbert looks nothing like the quarterback I saw at Missouri. The rookie is flinching during the act of almost every throw from the pocket. It’s actually disconcerting to watch because something is broken from the standpoint of his confidence or willingness to take a hit in order to throw the ball with the right mechanics to generate good accuracy. His spirit to compete in this sense seems broken. The Gabbert in college was almost reckless with his aggressive mentality and not the player afraid to make a mistake that he looks like as an NFL rookie. Gabbert could scramble around the pocket like Ben Roethlisberger and he had the arm to find receivers down field and the accuracy to deliver the ball only where those receivers could make the play. 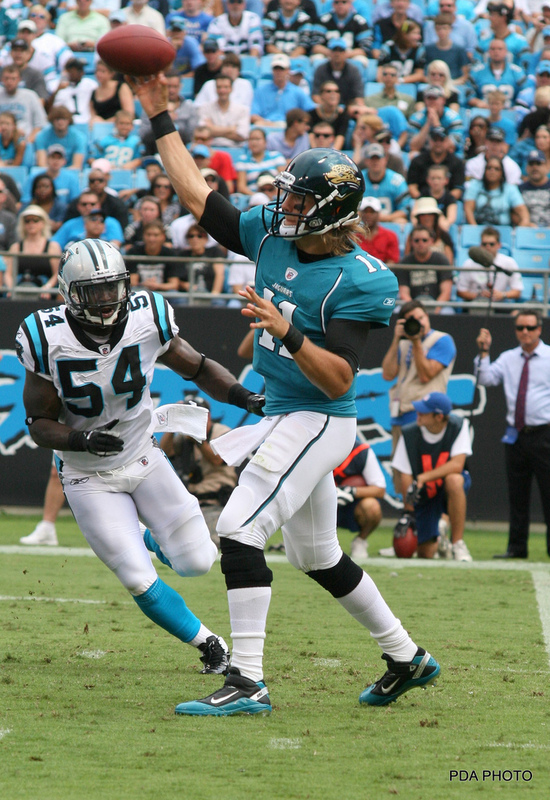 2011 RSP Quote: Gabbert is a big, strong-armed, and mobile quarterback capable of pinpoint accuracy and big plays. He is confident in his arm and accuracy and he will thread the needle into tight, man-to-man coverage or zone. Gabbert’s ability to move and deliver short and intermediate passes with good accuracy and make it look effortless is a reason why he’s a prospect with starter potential. In contrast to a player like Jake Locker, Gabbert can throw the ball on the move to his left, right, or from a back pedal and deliver the ball with pinpoint accuracy anywhere on the field in the 5-15 yard range. He also flashes excellent placement of the ball on the move from distances of 30-45 yards. When he sets and delivers with good form, he can throw the ball as far and with as much velocity as any NFL team should reasonably expect from a quarterback. However it’s Gabbert’s arm and accuracy paired with his ability to move in the pocket and keep plays alive with his feet that makes him a top-end prospect. The way he delivers the ball on the move or under pressure reminds me a lot of Brett Favre. He has the kind of trigger release at the last second and footwork that looks just like Farve on these types of plays. What I believe will make Gabbert a good NFL starter is that he approaches the game with the level of aggression needed to make big plays, but he also flashes the maturity to throw the ball away or find the quick check- down on early downs. I’m also impressed that Gabbert will also err on the side of over throwing his receivers rather than waiting too long and delivering under thrown passes that are more likely to get intercepted. Gabbert climbs the pocket away from pressure and keeps his eyes downfield while keeping his body in a good throwing position. He does a fine job of getting his feet under him to deliver the ball on the move with velocity and accuracy and he demonstrates nice anticipation of routes to give his receivers time to make the reception and then gain yards after the catch. Gabbert uses pump fakes and shoulder fakes with enough skill to manipulate defenders and create openings downfield. It’s the fact that Gabbert consistently integrates these skill sets on the field that separates him from prospects like Newton, Locker, and Mallet. and found hot reads in addition to making the game- changing plays expected from an elite, college offensive player. There were a lot more moments where Gabbert held onto the ball too long when he was under pressure in 2010 than in 2009. And he wasn’t as consistent handling pressure up the middle as he was from the outside. Gabbert also has a tendency to l make some very aggressive throws that won’t always work, but he is a player who does a better job of playing the line between aggressive and reckless better than the other strong- armed prospects in this class. He’ll be a gunslinger in the NFL capable of huge games and some big mistakes, but with a good team around him Gabbert could be a Pro Bowl QB and a long-term fixture for a franchise. His physical and technical skills remind me of a mix of Ben Roethlisberger, Brett Favre and Donovan McNabb. As it stands today, that player is in hibernation. Hopefully Gabbert regains that confident, gun-slinging nature that made him look like a potential playmaker at the position because when that Gabbert is on display, he looks like a player capable of carrying an offense on his back. Right now, he’s thinking too much and its effecting his pocket presence.